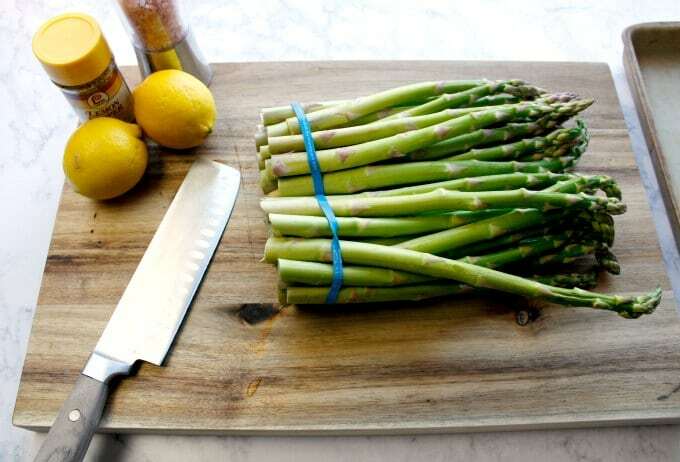 These lemon asparagus recipes make quick and easy side dishes. Best of all, you prepare both on the same baking sheet, giving you two quick and convenient side dishes with minimal clean-up! Asparagus. You kind of love it or hate it, right? Over the last few years, I’ve been trying to feed my family as many clean, fresh foods as possible. I’m proud to say we’ve made a huge shift in our diet and “green stuff” is a daily occurrence and not something we eat a little of once or twice a week. When is the best time to buy asparagus? Two easy asparagus recipes = two pans, right? Nope! 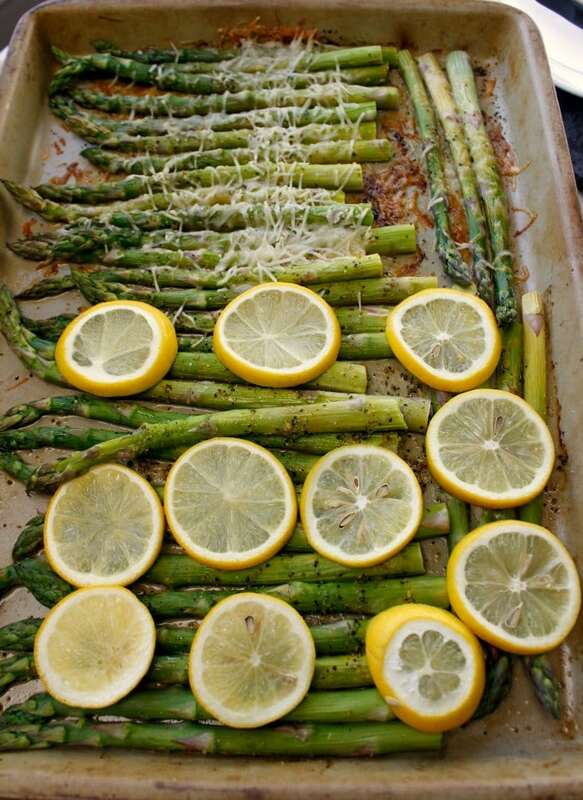 I’m going to make this stupid-easy for you by using a single baking sheet for both lemon asparagus recipes. When I say easy, I mean EASY! Before you do anything, wash and prepare your asparagus. Tip: Take 1 asparagus and snap towards the bottom (non-leaf part). Place the single piece of asparagus with the bundle and cut the ends off. Step #1: On a baking sheet, line asparagus. Drizzle with olive oil to coat and sprinkle with Lemon Pepper Seasoning. Step #2: On half place Parmesan and top the other half with sliced lemons. Step #3: Cook at 350 for 18-22 minutes, until tender and cheese has melted. Yum! 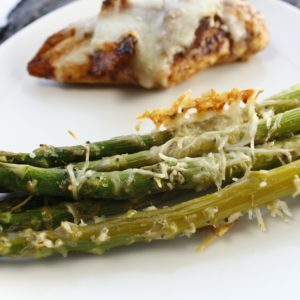 Two easy asparagus recipes for you and your family to enjoy. Asparagus wrapped in bacon: This is a great idea for those of you on the keto diet! Chopped asparagus in an omelet: An easy way to get in a ton of veggies in the morning. Caesar grilled asparagus: Top plain grilled parmesan asparagus with caesar dressing and croutons. 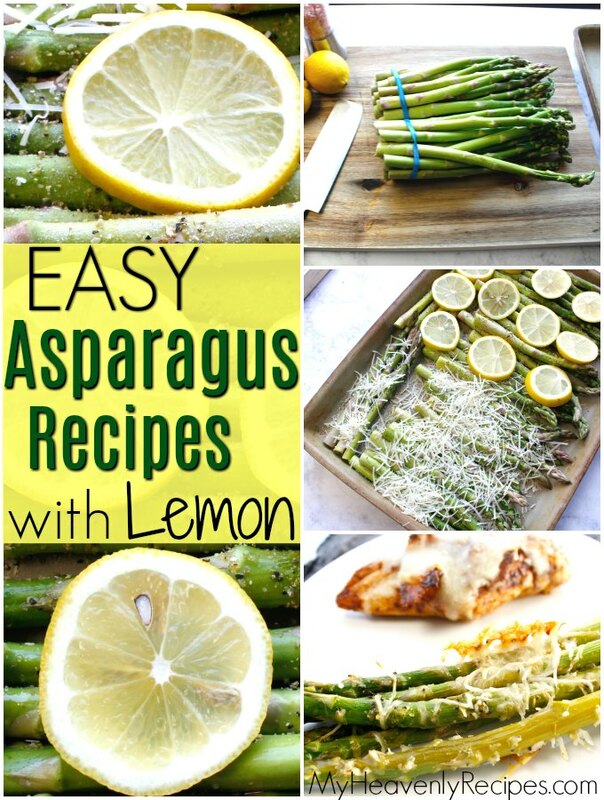 I hope you enjoy these lemon asparagus recipes! 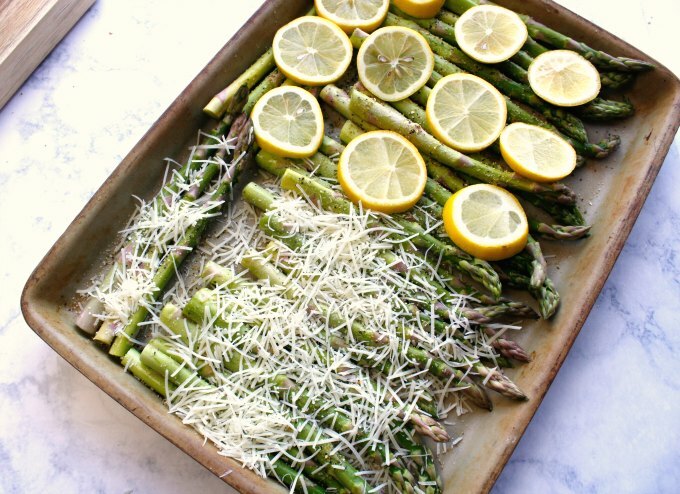 Make both of these tasty, easy-to-make lemon asparagus recipes on a single baking sheet! On a baking sheet, line asparagus. Drizzle with olive oil to coat and sprinkle with Lemon Pepper Seasoning. On half place Parmesan and top other half with sliced lemons. Cook at 350 for 18-22 minutes, until tender and cheese has melted. 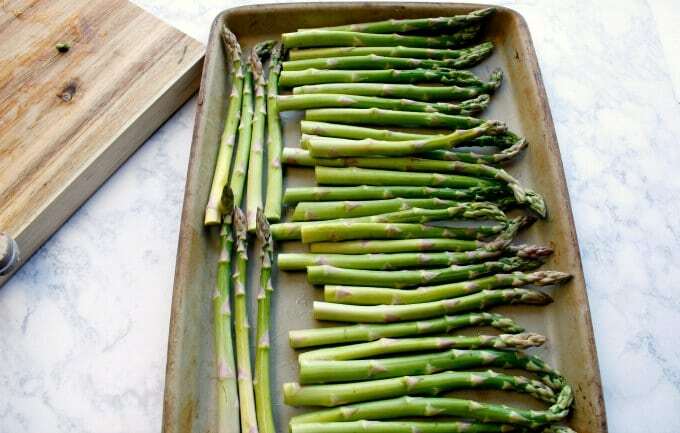 TIP: Take 1 asparagus and snap towards the bottom (non-leaf part). Place the single piece of asparagus with the bundle and cut the ends off.